A visit to Puerto Ayora on Santa Cruz Island in the Galapagos provides two unique opportunities to enjoy the Galapagos Tortoise. The first is a must visit located on the outskirts of town at the Charles Darwin Research Station. The tortoises located on the Research Station are used for educational and conservation purposes. 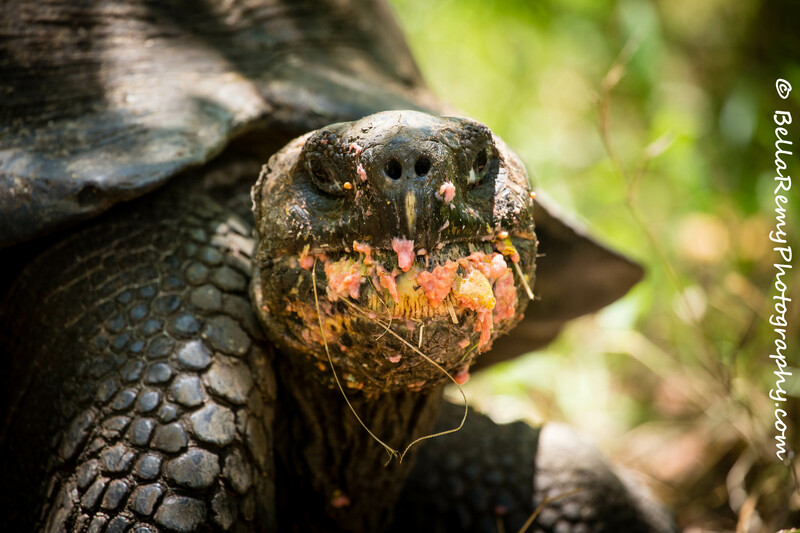 However, Santa Cruz Island is also home to wild Galapagos Tortoises that travel many miles to reach the highlands and an orchard of beautiful Guava trees. This Guava orchard was originally planted for harvesting and it didn’t take long for the Galapagos Tortoises to figure out how delicious they are. At Rancho Primicias, the land owners decided to make their farm a sanctuary for the tortoise and now leave the Guava trees free to drop their fruit. The Guava is an introduced tree to the Galapagos Islands and is actually invasive to the islands. But it has been a gift for the tortoises. A 30 minute van drive from Puerto Ayora brings you to Rancho Primicias that offers a well built visitor center. Between the months of February through June there are only a few tortoises present. That is, if you think 12 or so that we actually saw are just a few. 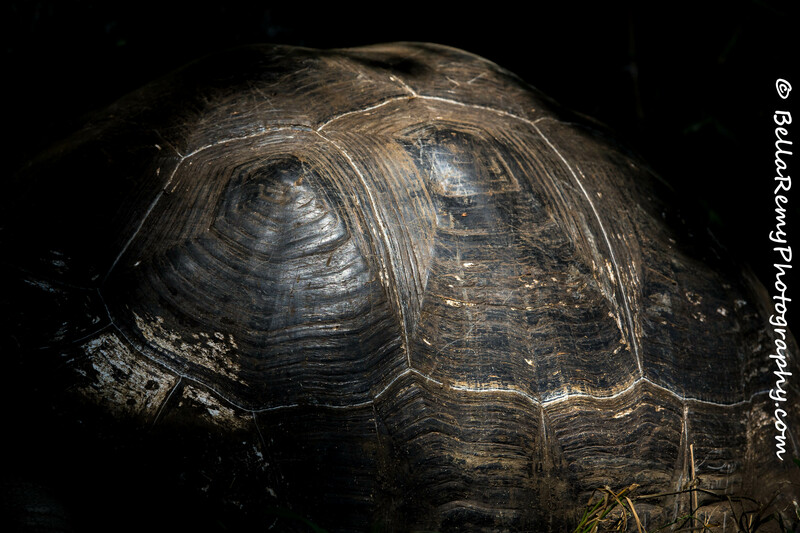 October is prime season for a large number of tortoises that travel to this sanctuary. One can visit Rancho Primicias from Puerto Ayora by taking a taxi from town for about $30 round trip. The Entrance fee is $3.00 without a guide. Looking over the landscape large round bumps catches your eye. Within the grounds is a wonderful Lava Tube where we entered into the depths of the earth from a warm, humid and sunny day to a cool, dark and damp tunnel. Lava tubes are naturally created by flowing hot lava beneath hardened lava. In contrast is a mud pit where the tortoises crawl to cover themselves with cooling mud. 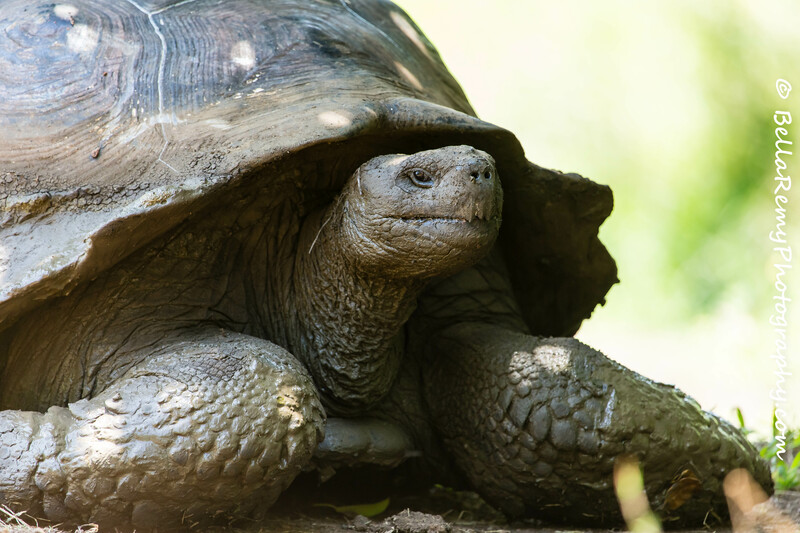 If you get too close, the tortoise tucks his head in his shell, hissing as he exhales the air from his body. 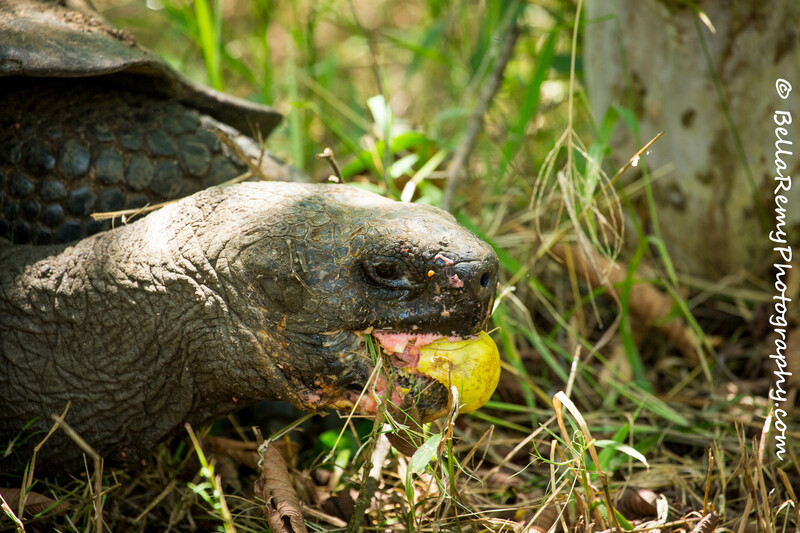 The best of course is to watch a Galapagos Tortoise thoroughly enjoying ripe Guavas readily available on the ground. As my friend says, oh to stay on this farm and get fat on ripe Guavas. What a life! Haha !! Love your comment Perpetua ! Indeed, getting fat on Guavas. What a nice life. Didn’t even think about how the seeds are spread but you’re absolutely right? Wonder why it’s not Guava Island yet. Thanks and hope all is well with you. Now Bente, why would I find that hard to believe? Somehow I imagine you a true cosmopolitan. I found it apropos that an invasive plant is helping an endangered species! I bet the orchard gets a 5 star rating on tortoise trip advisor! What’s interesting is that it is sort of off of the beaten track. Some cruise ships take people there, but not too many. I had a hard time imagining Guavas being invasive. Had you heard that before? People moving stuff around again! This is why the Galapagos is such a special place as it is mostly well preserved. Other than being rather messy eaters, the tortoise are quite cute! Guava all over the face, what’s not to love? Come on, when was the last time you played with your food? Oh how I wish you could have been on this trip with me. Hugs.